We’re still very much in the grips of that monolith of global sport, the World Cup, even though the Australian side has been bundled out in the group stage of the finals. If you’ve watched a dozen games or perhaps only the three that we took part in, consider giving this a go. More information below. 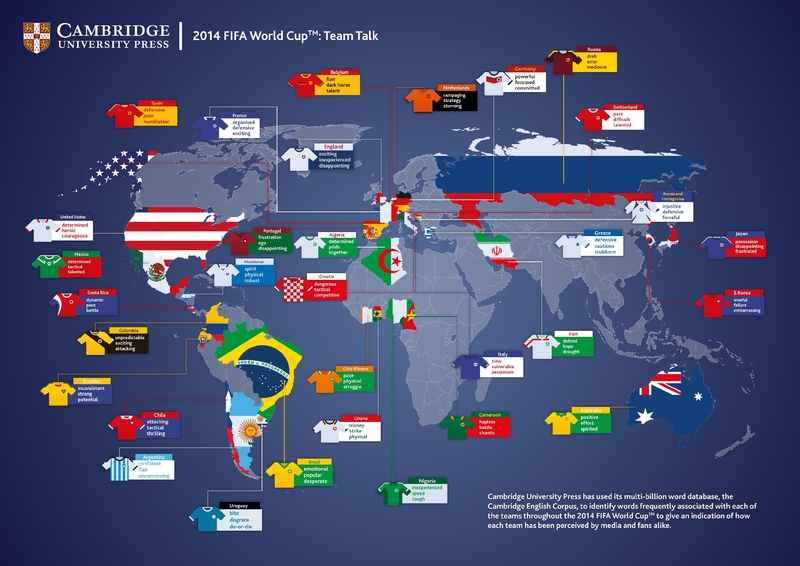 As the 2018 FIFA World Cup™ captivates upwards of 5 million viewers globally, the world’s oldest publishing house is collecting data on football fans’ language across the 32 participating countries. People are being asked to enter the three words they think best describe each national team on the Press’ website. The Language Research team will then analyse them as part of a study into the language used when writing about the tournament. The public’s contribution will form a ‘People’s Corpus’, a collection of words which researchers can then compare to the language used in the media to reference different teams – the ‘Football Corpus’. The results of the research, including the top three words for each team, will be revealed ahead of the final match on Sunday 15th July. Almanackers, we’d be keen to know your own three word summation of your team at the World Cup in the comments & of course, please do your part for the project at their site too, while helping charity. Cambridge’s 2014 version results. Published online by Cambridge University Press. What a wonderful day for England’s foes! They frustrated our knavish tricks, but it was one knavish trick too many, from Croatia of all places! As for the parcel of rogues in a nation: Farange, Boris Johnson, Rees-Mogg and all the jingoistic English gutter press – suffer in your jocks! No one deserves this day more than you! Commiserations to Martin Tyler, the Bruce McAvaney of England, he sounds like a decent bloke.